(1) Information-Communication Stage: This is the initial stage of health disturbance. In this initial stage, there are no visible symptoms. These disturbances are not felt by most of us. We have no knowledge of them as they occur. The disturbances are present at all times. The origin of these disturbances is from the mind, the physical-psychological environment, the things we eat, and the way we live. One of the biggest sources of disturbance is from our mind, defined in quantum physiology as brain-soul interactions, where the soul is defined as the space-time continuum of one’s Self. Although there are a few sensitive individuals who feel the emotional or psychical disturbances, perhaps the most common sensation is tiredness (mental and/or physical). Most people do not feel anything because of minimum awareness of communications between the individual’s mind and the body. Tiredness is the body’s natural way of saying No. It is the body’s way of telling you to listen. All tiredness caused by miscommunications is the result of dualistic conflicts, the want and not want, love and hate, or simply the duality of sedating versus tonifying certain physiological functions. The corrections treatments for these miscommunications are acupuncture, homeopathy and mental-psychological consultation. Consultation involves understanding the existence of a conflict and the knowledge to harmonize these conflicts. This is the stage where quantum mathematics, integrated with binary-ternary logic, is applied and in most cases, early detection of these disturbances or miscommunication has proven to be accurate. In fact, when certain symptoms (even physical symptoms such as disturbances in prostate communication) are detected in our health computer, conventional medical tests will indicate the abnormal chemistry two to three years later if the disturbed information is not corrected. Thus, if these disturbances continue without correction, the damage will progress to the next stage of health and wellness. This is the functional stage. Thus, the feeling of tiredness progresses to Chronic Fatigue Syndrome. (2) Functional Stage: In this second stage, the normal functions of an individual’s physiological systems and the organs are affected. The individual will begin to have symptoms such as those stated in stage one, tiredness plus aches and pains, dizziness, gaining and losing weight, etc. However, in this stage, the symptoms are chronic. The most common is Chronic Fatigue Syndrome. Again, the individual does not consider himself or herself ill. Here illness is defined as structural changes, such as changes in blood chemistry, or in x-rays and other pictorial representations of the anatomy. Namely, these are the findings in conventional medical diagnoses; thus these symptoms are outside of today’s conventional medical model, let alone, corrections and treatments. 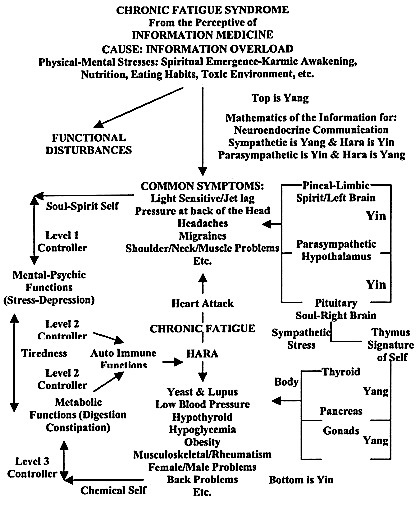 Most of these disturbances are from (1) the neuro-endocrine functional miscommunications of the hormonal system, especially the dualistic conflicts in pineal-thymus-parasympathetic and the pituitary-sympathetic networks, and (2) in the fermentation of undigested foods due to a functional abnormality in one’s metabolic functions. In turn, these fermented foods develop bacteria inside the guts and mucous lining of the stomach. Furthermore, in serious cases, both networks of neuro-endocrine and metabolic functions interact with each other to produce complicated symptoms of autoimmune disturbances. The corrections-treatments to these functional disturbances are both eastern and western herbs. If these functional disturbances continue to progress without correction or treatment, the damage will progress to the third stage of health and wellness, the Stage of Illness. (3) Illness Stage: This stage has to do with changes in physiological-anatomical structures including changes in chemistry. This is where today’s allopathic doctor begins his or her diagnosis and treatments. However, at this last stage of health-wellness disturbance, all three stages are present. This explains the side effects of medicines, for medicines are needed to treat the specific areas of structural change. However, to be effective, these treatments must be strong and pinpointed; and thus generally affect both the communication and the functions of the individual’s entire body-mind physiology. These generalized actions are often referred to as side effects of the medicines. To correct these side effects, further medications are prescribed and, in turn, create more miscommunications and abnormal functions. What is needed is the combination/integration of all three stages of corrections and treatments. This is what we at E-W Institute refer to as the integration of medicine. 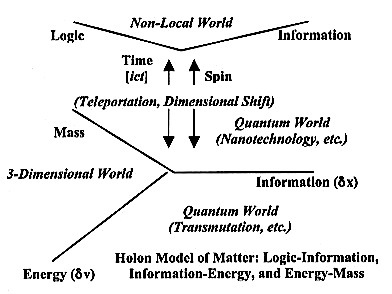 In the Holon Theory, the concepts of health/illness are based on a paradigm shift in our scientific understanding of the concept of matter. Matter, this stuff that makes up our bodies, is drastically different in our reality as understood in the 21st century from that proposed in the 19th century. In the 19th century model, matter is simply a particle. 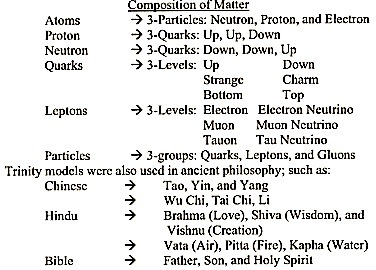 Particle physics is Newtonian mechanics. Likewise, the model of health/illness is based on bodily functions. Allopathic medicine was developed based on the anatomy and physiology of the human body. In the 20th century model, matter is both particle and wave, which is a dual aspect. The physics of particle and wave brings in quantum-relativistic physics. Likewise, the model of health/illness is based on the dual actions between mind and body. This mind-body duality contributes to the dualistic conflicts between allopathic and alternative medicines. These conflicts between allopathic and alternative medicines have their origin in our present understanding of quantum-relativistic physics, which was in turn generated from the conflicts embedded in our dualistic model of matter. Therefore, to resolve the conflicts between the allopathic and alternative models of medicine, one needs to first resolve the duality embedded in the quantum-relativistic definition of matter. In short, we need to resolve the dualistic difficulties hidden in the internal interactions between wave and particle. Our breakthroughs, after 40 years of related private research succeeded where the NIH research failed. In short, this Health Computer is the only workable illness preventive system in the world. Based on our breakthroughs with the Holon Information-Communication paradigm, we are able to put the communication network of the neuro-endocrine system into a set of mathematical formulas; our Health Computer can uniquely compute the health-information of an individual. As explained by the Holon paradigm, this is only the first of three stages on the health of an individual. The other two stages are the functional stage and the illness stage. The mathematics for both the neuro-endocrine and the hara networks not only captures the physical health, but also the total health-communication of the entire body-mind/soul-spirit of an individual in various modules besides the physical health module. Each of the organs, namely, Lu, LI, HC, Tw, Ht, SI, and so on, has their own networks of acu-points. These networks, referred to as meridians, can be found in any acupuncture textbook. 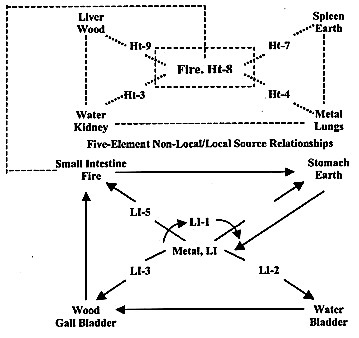 In addition, each of these organ networks has their own five-element networks, as shown below. There are five sets of these networks. There are also interacting networks between these organ networks and the extra meridians, see Symmetry. These sets of networks, within networks, are simplified and formulated in the mathematics for the Health Computer. For a further discussion of the endocrine acu-point networks, see Symmetry. The output of the Health Computer, in the physical health module, consists of (1) the information-communication disturbances and possible functional symptoms of the individual’s neuro-endocrine-hara networks in real time and (2) the remedies, corresponding to these disturbances, in the form of herbs, homeopathics (including Bach flowers and Cell Salts), natural oils, food recommendations, and acupuncture points for acupressure or use by an acupuncturist. The entire health evaluation is automatic with little operator participation and thus can be implemented in the Worldwide Web, special clinics, and ordinary medical offices. Schrodinger’s Cat This paradox exists because of the Heisenberg’s Uncertainty Principle. The state of the cat, alive or dead, depends on the logic of Schrodinger’s key. Therefore, which lock, i.e., the lock with the alive logic or the lock with the death logic, will the key fit can only be known after Schrodinger’s key found its lock. Quantum incoherence: The process by which multiple possible realities permitted by quantum observation are eliminated. 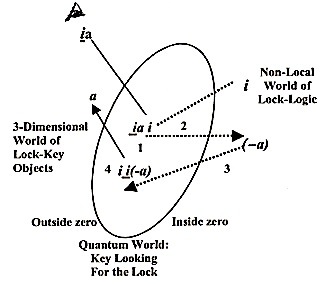 In the Holon Theory, incoherence is possible by understanding the encoded information of the particular lock-logic that needs to be opened, and the knowledge of Co-Creating a key-logic together with a deterministic way of getting the key to meet the lock. What we described here are the necessary and sufficient conditions for Co-Creation. Hexagrams: Formed by pairs of trigrams. (See Trigrams, and Ebits/Qubits). Hologram: Every element of a body contains the whole message of the whole body. A 3D hologram can be created with the intersection of three self-coherent light rays, orthogonal to each other. Homeopathy: Remedies diluted to the extent that no remedy molecule (namely, its particle-mass aspect) exists in the diluted solution in any detectable form. What exists, in the context of remedy, is the logic-information of the remedy molecules. i: Interpreting this imaginary, i, as a teleportation operator is another break with traditional physicist’s thinking. This number i is a mathematical term defined as [= (-1)1/2], i.e., i x i = -1 and [i x i] x [i x i] = 1. This operation of i with itself is shown below in the notion of a teleportation operator operating on a. 1. Prediction of personal events, or answers, based on one’s informed intention and the encoded message hidden in the trigrams and hexagrams obtained by one’s throw of three coins or fifty sticks. The intention is formed by formulating your question, writing it down and then letting it go, but being aware of it. It should be short and concise. If possible, try to get an image of the question in your mind. Notice, the more you are informed with your question, through self or learned knowledge, the more accurate your answers will be. With this intention in mind, you throw your three coins or fifty sticks. In throwing your three coins or fifty sticks, you should forget, or stop any mental activities on the questions you asked, i.e., let go of any mental processes related to your questions. Finally, in interpreting the trigrams and hexagrams obtained from your throwing of the three coins or fifty sticks, the I-Ching text is used only to awaken your spirit knowingness, which is from where your answers must come. This process is defined by the 27 information dimensions, whose accuracy depends on your informed free will, which is dependent on your learned knowledge and your spiritual knowingness, and the degree to which you have satisfied the conservation between logic and information. 2. Prediction of your karmic patterns and destiny based on the symmetry breaks, in the cosmos and in your reincarnation, caused by the birth of you, namely, the addition of a new piece of matter in the universe. This process is also defined by the 27 information-dimensions, whose accuracy is dependent on your informed knowledge and the degree you have satisfied the conservation between information and energy. 3. Prediction of your karmic patterns (and sometimes destiny) based on palmistry and facial features. Notice that your hands and facial features are somewhat related to the karmic information encoded within your acu-point networks. The accuracy of this method is dependent on the degree to which the encoded information is converted, without too many disturbances, into energy-mass, namely, the features of your hands and face. 4. Medicine: Acupuncture and herbal formulations for the maintenance of one’s body-mind/soul-spirit health, which also includes the correction of one’s karma and satisfying one’s destiny. This science is also formulated within the 27 information dimensions, which is strongly connected to the method used in items (1), (2), and (3). The purposes are to correct any entropy productions in body-mind/soul-spirit health by normalizing the three conservation laws of matter, namely, the conservation between logic-information within the spirit, information-energy within the mind, and energy-mass or chemistry within the body. Imaginary Number, i: equals the square root of -1, or [-1]1/2. In the Holon Theory, this number is used as a teleportation operator, teleporting between dimensions four and zero, i.e., i 0 = i 4 = 1. Likewise the imaginary number w, defined as [ + w2 = -1 + w ], is also a teleportation operator between dimensions six and zero. These operators are also referred to as hypernumbers. In addition, the letter i corresponds to the integer number 9, which is one of three teleportation integers. The number 9 is also a spiritual number that connects with God’s Encoded Logic. In base 9 arithmetic, the number 9 contains all integers, i.e., 0 + 1 + 2 + 3 + 4 + 5 + 6 + 7 + 8 + 9 = 45 à 9. Thus, the number 9 contains the ability to dimensionally shift to all other dimensions, from 0 to 9, in a base 9 system. Immortality, of the Spirit: In the Holon Theory, this is the lock representation of you, namely, the set of encoded logic that defines the three-dimensional aspect of you. This lock exists beyond space and time. It is your logic-body and hence it is immortal, but your set logic, or your logic-body, is modifiable. This set of logic, or your spirit, is immortal because it is connected non-locally to the initial set of logic at the universe’s creation, which is the set of logic that defines the First Cause. The act of modifying this set of logic, or the lock, is referred to in the Holon Theory as involution, the opposite of evolution. Evolution represents the evolvement of your soul through the reincarnation of your body-brain networks. On the other hand, involution has to do with the involvement of your spirit to a perfect set of logic, corresponding to a final condition, which defines your destiny. At that final stage of your involution, your spirit will be in the Image of God. Notice, the soul, contrary to popular belief, produces a temporary aspect of you in the quantum world of space-time continuum, for it represents the probabilistic path of your key, created by the intention of your brain, finding your lock, which is your spirit, (see Embryology). This lock can also be something unstructured or questioned in your brain’s unconscious mental activities or intentions, such as the space-time image encountered in your astroprojection. Inflation: A brief period of accelerated expansion during which the very early universe, about 10-35 sec after the Big Bang, increased its size by an enormous factor. This inflationary assumption is not part of the Holon Theory. The concept of an inflationary universe is automatically embedded in the non-locality of the logic-information aspect of matter. Inspiration: Knowing through mind/soul-spirit intention. An inspirational state is a state of spirit-knowingness occurring inside a singularity. Intuition: Visual learning through the right brain. Intellect: Linear logical learning with the left brain. Kingliness Without: A person’s action emulates the actions of a noble King.